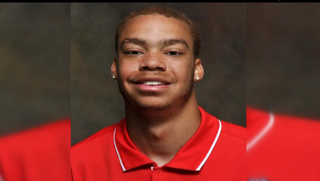 A California State University, Fresno, football player was arrested after allegedly making a social media threat in which he described how he would shoot students on campus, CBS News reports. The threat was made anonymously via the messaging app Yik Yak on Monday, Fresno State Police Chief David Huerta told the news station. According to the report, the message included a photo of a campus library and detailed how a gun would be used. Huerta noted that the messenger suggested that the attack would come that same afternoon. Officers followed the IP address from the computer used to send the message to find and arrest the student responsible for the threat. According to the report, Huerta would not identify the student, but the university said that Christian Malik Pryor, an 18-year-old on the football team, was arrested on campus for making criminal threats. Pryor allegedly made the threat to "release my frustrations" around 3 p.m. Monday. Female students were specifically threatened, according to KGPE. "To the fullest extent of the law, we'd like to see something done with this. This isn't a game. This isn't something people just do," Huerta added, according to the news station. Pryor, who reportedly admitted to sending out the message, was later released on $20,000 bail. Read more at CBS and KGPE.